All year I crave apple pie. I can’t wait for the cinnamon flavor to fill my kitchen, to devour that delicious crust. But when that autumn moment comes, that cinnamon-apple-crust moment, I just can’t allow myself to indulge. Loads of white flour, white sugar and heavy fats, everything sounds so wrong but yet it tastes and smells soooo good! This year I decided to search for alternatives, experiment and recreate an apple pie worth indulging in, every piece of it, guilt free! – replace white flour, which is completely lacking in nutrients and fiber, with almond and buckwheat flour. They give a nutty taste and enrich your pie with fiber and minerals. I decided to go further and create an even healthier pie, so I used gluten-free flour for the crust. – cut down the cholesterol by replacing the butter with coconut oil – the flavor will be more intense and your arteries will thank you. – use apple varieties that are not very sweet, like Granny Smith. Tip: don’t through away the peels, simmer them and obtain a liquid with calming effects, especially if you have insomnia or agitated sleep. 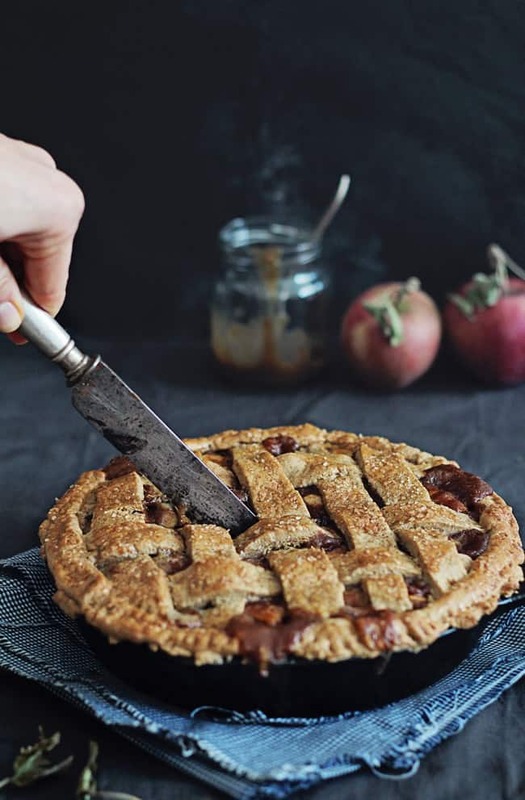 Your pie will still taste delicious- and you can indulge in a slice (or two or three) without worrying about sugar overload or unwanted pounds! If apple pie is your favorite autumn dessert you will love this guilt-free version. Gluten-free, low in sugar, low in unhealthy fats, but with a gorgeous taste and bathed in healthy caramel sauce. Prepare the crust dough - In a food processor, with dough blade, pulse the gluten-free flour, baking soda and sea salt until well combined. Add the coconut butter and pulse to obtain crumb-like texture. Add the cold water and vinegar, and process until well combined. Remove the dough from the processor, wrap in plastic foil and refrigerate for 30 mins. Peel the apples, remove the cores, and cut in cubes. Place in a bowl and set aside. Prepare the caramel sauce - mix the lemon juice, water and sugar in a sauce pan and bring to boil over medium heat. Add the coconut milk and sea salt, mix well and let simmer for 10 mins until the liquid thickens. Remove from the heat and pour it over the apples. Add the cinnamon and mix to combine. Divide the dough in two, roll them out and place one on the bottom of the baking pan. Fill with apples in caramel sauce, place the top crust on, sprinkle with sugar and bake for 10 mins. Reduce the heat to 175°C/347°F and bake the pie for 35 mins. Ana is a healthy recipe writer, food photographer and soon-to-be certified nutritionist. She shares her vegetarian recipes, healthy lifestyle tips and food photos on The Awesome Green. What flours did you use for the gluten-free flour blend? You mention using buckwheat and almond flours in the post, but the recipe doesn’t detail the amounts of each flour used. I’m super excited to try this pie crust!! I love your addition of a healthy caramel sauce here, this apple pie looks so delicious! I love apple pie but cannot remember the last time I ate one! Not only does your apple pie look delicious but it is healthy as well.. definitely a recipe I need to create! 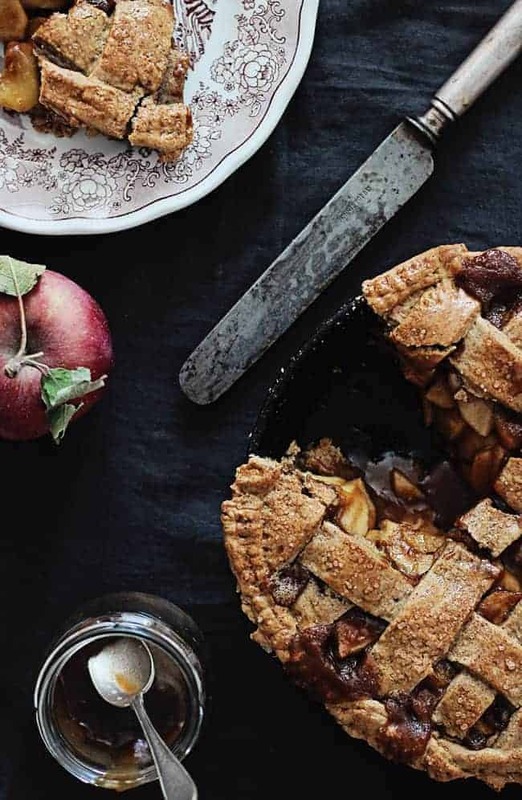 This looks super delicious – I love warm apple pie in the cool months!